The Paleo Slow Cooker book I posted last week, has been a huge hit with fabulous dish after fabulous dish. Let’s just say – left overs haven’t been an issue, as the children have licked their plates and bowls clean! This was super easy, and a nice spin on an old favorite! Place chicken in the slow cookier, then the chopped veggies, add in chicken broth and seasons. Cover and cook on low for eight to ten hours. ENJOY! so that those who have believed God may be careful to engage in good deeds. 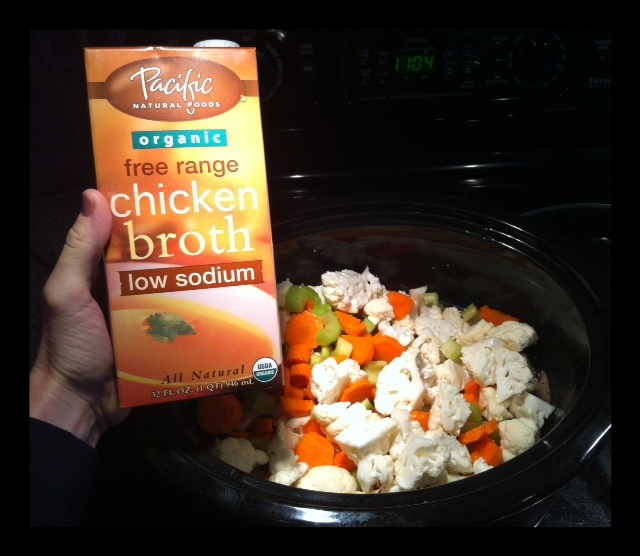 Posted on October 10, 2012, in Celiac/Gluten Sensitivity, Food To Try, Our Struggles and tagged celiac disease, gluten free soup, gluten intolerance, healthy for him, Noodle-free chicken soup, Paleo Slow Cooker Cookbook. Bookmark the permalink. 1 Comment. Definitely will be trying this this soon 🙂 Thanks for sharing good and nutritious meals with us!